Eight years ago — I remember sitting at my kitchen table with the sun streaming in through the window — the TV was on with President Obama’s Inauguration address. His speech contained the most inspired words I had ever heard from any politician, or any public figure for that matter. I felt lifted up, suddenly filled with purpose and hope. This was a significant moment as it reaffirmed my wish to become a writer, to inspire people as much as I was inspired at that very moment. I jotted down a few lines. They turned into a poem that would stay with me from then on. Whenever I feel unprepared for this journey, whenever I feel lacking the very basic modules of inspiring others, I turn to the poem, knowing that it didn’t come from me but from something much bigger, something that connects all of us on a level we very rarely have access to. This place seems to be what we all aspire to reach, in whatever shape or form we do so. I strive, at times in vain, to get close to it. But sometimes, not often enough, I can hear the call with such clarity, it cannot be dismissed. On Forging and Writing. And Pain. I think it was Hemingway who said that writing is nothing but sitting down in front of a type writer and bleeding. I agree wholeheartedly. When I began writing this post, I wasn’t completely sure what I wanted to convey other than a feeling I couldn’t quite pinpoint. All I knew was that it was about forging and writing and pain. The three go together. It’s so interesting that when you look at a mundane day-to-day task and you don’t think anything of it until you look closer and from there you discover a whole other world coming to life because of it. The thing itself becomes a door that opens and what’s behind it is nothing but endless vista. You heat up metal to such an extend that it begins to glow. It’s not melting. Yet. But it gets so hot that it glows red. Then you can form it and shape it and make it into something new and beautiful. I’m an electrician by trade. In order for anything to happen, anything at all to happen in an electrical circuit, things have to heat up. The resistance of the very material the current that flows through generates heat. Electricity is heat. Can you hear the metal scream? It’s a powerful scream, a life changing scream. It’s a scream that foreshadows change. It’s like when you bench press and you’re at the eleventh one and you don’t think you have it in you to get this thing up once more but you want to and you start to scream and eventually you push it all the way up. Forging and pain and writing go hand in hand. At least for me. Take the Hemingway quote where writing is nothing but sitting in front of a type writer and bleeding. We think pain is bad. We think it’s something to be avoided. We think we need to distract ourselves from it. For this post, I’m talking about emotional pain, the pain that is inside, that turns your stomach upside down and makes us hurt even though we don’t know where. Our heart, our mind, our soul. We try to avoid it but that would be like the iron rod that wants to stay at room temperature. Sure it’s more comfortable that way. But is it better? Some spiritual practices tell us to stay with it for a while, to let it rise up from the depth and come to the surface so it can be dealt with. I’ve been through several phases in my life that were painful. The first one (only in hind sight do I see the pain there) was when my parents separated when I was eleven. It was excruciating. Then there were some break ups and heart breaks and then there was a phase where the pain was not connected to anything other than the inevitable pain that comes with major internal change. I was the metal that lay in the forge waiting to reach a temperature high enough to become something new, something that was still the original material but now closer to the form it was meant to take on. The new is already present in the original, it’s all there waiting for heat and pain to get it to a point where it can be molded into something closer to what it was intended to be. I very rarely can write a story without tapping into that experience – the pain that is the heat that preludes the change for the better. It’s the moment when it’s the hardest to continue, when the storm is the strongest and the night the darkest. That’s when the metal reaches the temperature that allows it to be forged. That’s when beautiful, intricate, stunning forms take shape. Like a song. Like a painting. Like a story. In The Traveler, a twelve-year-old girl is devastated by the death of her father, a master blacksmith. From him, she learned how to work with metal. From him, she learned how to create beautiful things out of cold, dead objects. Now, after his death, he challenges her one more time to reach beyond what she thinks she can do and create something that seems entirely impossible. I’ve had a good month publishing wise. At least for me it was a good one. I still have a regular job that I’m very involved in and that pays the bills, etc, and I wouldn’t be able to leave that behind at this very moment. I like my job. It gives me the flexibility to do what I love to do. Of course, everyone of us self published authors dreams about one of our books taking off or a movie producer knocking on our door, and I’m no different. There is a fantasy phone call I’m getting periodically. It’s from Peter Jackson. I’m sure, if you’re a writer, you’ve got your own even though I hope it’s not Peter Jackson. I don’t want him to be distracted with another book he wants to make into a three part movie, besides mine. You understand. This is the Amazon chart on my Kindle page (U.S. only). It shows me how many copies of my books have sold and, secondly, how many pages of my books people who are on Kindle Unlimited have read this month. The latter are the Kindle Edition Normalized Pages (right column). Basically, anyone who publishes exclusively through Kindle Direct Publishing (KDP) gets payed in two ways. One is for the copies sold and one is for the pages that have been read by people who are enrolled in Kindle Unlimited. In my case, so far this month people have read just under 7,000 pages of my books. That number sounds like a lot, right? 7,000 pages of stuff I made up has ended up in people’s heads (at least for a moment). In reality, that’s roughly one sold copy per day. When Andy Weir put his novel The Martian up for the kindle, it was $0.99 and sold 300 copies per DAY. The Martian is an amazing book. I’m hoping to get to a level of writing craftsmanship where I can say the same for my own stuff one day. I’m not a bad writer but I know how much I still have to learn. My (for me) good month was most likely caused by two things: I have lowered the price for all of my books to $0.99 per copy for the kindle. That’s as low as Amazon allows it. At that price, there is a 35% royalty to me per sold copy. Above $2.99, it goes to 70%. The second reason is probably the fact that I was involved in two anthologies recently. The Time Travel Chronicles and Tails of the Apocalypse. I had a short story in each of them. Time Travel Chronicles came out beginning of November and Tails of the Apocalypse came out toward the end of November. They both sold fairly well and readers must have liked my stories and bought the copies of my books this month. Makes sense. I’ll see what February brings and will report back to you but my plan is to keep my books at $0.99 per copy until I sell so many copies that agents and publishers notice it. Not a lot of people know me. There are a lot of books out there to choose from and a lot of really good quality content. I want my potential readers to have as low of a hurdle to have to jump over as possible. Let the work speak for itself but let it be out there and let it be available for as little as possible. I realize that there are many other marketing strategies that work. But this is the conclusion I came to, in part after listening to some of the Author Stories Podcasts by Hank Garner and talking with or being involved in projects with other authors. There’s a lot of help out there and the community of self published authors I’m in is incredible. I wish us all much success and more great stories to come out of this than ever before. And Peter Jackson. The time: Summer of 1951. The place: A small town a few kilometers from the border inside the Russian sector in East Germany. It was very simple: Russia, having lost thousands of men during the war against Germany, needed workers. After the war ended, they began scouting German villages in their sector for able bodied craftsmen. Welders and carpenters, blacksmiths and painters, all were in high demand. Those were the fathers who had just returned from the war, now trying to build their families and lives in peace. Whoever would be taken by the Russian authorities, would disappear and end up in a mine somewhere deep inside Russia, never to return. My grandfather was one of them. Being a master craftsman, he knew, they all knew, that it was only a matter of time for him. So he left, crossed the yet relatively open border to stay with friends on the other side for a year. The second, not less terrifying prospect was the imminent closing of the border. My grandmother, now alone with four children, was friends with the soccer coach who knew one of the border guards. For one year, knowing where the guards were at any given time, she smuggled their belongings on her back at night, through a stretch of forest and to the other side – the free side. And then, on a Wednesday morning at 2:30 am, when the guards had just passed through their part of the border, they fled. Taking with them only what they could carry on their backs, my grandmother and her four children, ranging from six to fourteen, made their way through the woods. They landed in a small village in West Germany where friends took them in and they reunited with my grandfather. Here, the six of them stayed in one room for a year. My grandfather worked as a painter and my grandmother helped the family who had taken them in. They began to rebuild their lives and family in peace. I was born fifteen years later. 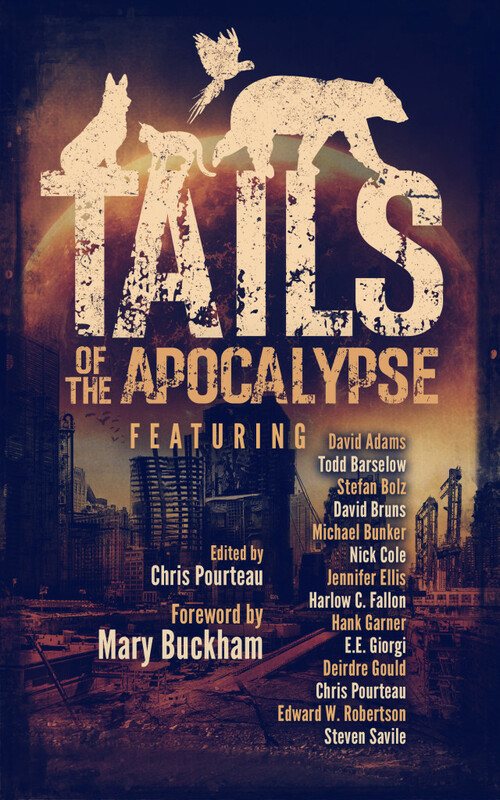 That’s how author-editor Chris Pourteau talks about his latest project, Tails of the Apocalypse. Described as The Walking Dead meets The Incredible Journey, the collection includes short stories written by 14 of today’s most innovative independent authors. Tails of the Apocalypse examines world-ending scenarios—from nuclear war to natural disasters to planetary pandemics—featuring animals as main characters. The idea came to Pourteau last spring after publishing his own short story, “Unconditional” about a dog searching for his boy, lost to the zombie apocalypse. The overwhelmingly positive response from readers made him think that maybe he’d hit a cultural nerve. And the idea for Tails of the Apocalypse was born. Even as the anthology took shape, Pourteau felt like he was missing something. The point of these wonderful stories about animals caught up in dystopian situations was about giving voice to those without the ability to speak for themselves. He decided he wanted to donate some of the profits from his self-funded project to an organization that helped animals. It was one of his authors, David Bruns, also a US Navy vet, who suggested Pets for Vets. From the beginning, it was great fit. The name and the mission of the non-profit immediately resonated with Pourteau. And as Bruns and Pourteau have worked to drum up awareness of their project, they’ve found that the cause resonates with others as well. Founded by animal trainer Clarissa Black, Pets for Vets matches shelter dogs with military veterans. Personnel train the animals as special companions for veterans suffering from emotional trauma, like Post-Traumatic Stress Disorder (PTSD). Join the Tails for Vets Street Team — Get email updates and shareable content by joining the Tails Street Team. Facebook banners, a “badge” you can post online to show your support, and chances to win paperback and audiobook copies of Tails of the Apocalypse are all available to the Tails Street Team. Buy the Book — Tails of the Apocalypse launches on November 20th, but you can preorder on Amazon now. Remember: $1 from every purchase goes to Pets for Vets. “I am somehow drawn to ancient landscapes”, I hear myself say to Julie, my therapist. That was back in 2008. I went to her for a few years and on that particular day, on my way to her practice, this sentence came into my head. I couldn’t figure out why it had come to me. In our sessions, we had explored different inner landscapes, usually connected to a conflict I was experiencing or an issue I was working on. That morning, before I arrived at her house, I realized that I had no idea what to talk to her about. Or so I thought. About an hour into the session, I heard myself mentioning the ancient landscapes and that I somehow felt drawn to them. There was nothing specific in my mind. No imagery, no picture of old pyramids or anything similar. Julie asked me if I wanted to close my eyes for a minute and see what would come up. Usually, for that, I’d lie on her table and we go through this process a bit differently but we didn’t have that much time left and I really wanted to see where this ancient landscape was and what it meant, if anything. So I closed my eyes and for a while I waited for an image to show. It didn’t. Nothing happened until at some point the words “before time was” appeared. I told Julie that the ancient landscape I was referring to might have been there before time was. This was obviously an oxymoron because how can something exist – a stone, a tree or a forest – before time existed? Without time there is no growth and nothing can start or end or be at all. Those and other thoughts passed through my mind in a split second. But I felt that there was something else there, something I had missed or hadn’t understood properly. Then I saw, almost in a close up, a couple of old stones, overgrown with moss. As I pulled back, I realized that I stood in the middle of what must have been an old foundation. The stones were almost completely grown into the ground. Grass covered the soil. Judging by the outline and size, it must have been an old church or chapel at some point. For some reason I had the distinct feeling that the ground I stood on was very holy. Holy in the sense of clean, untouched, undisturbed – and very old. Another thing that was very interesting was the fact that there was no sound. It wasn’t just the absence of noise. It was complete stillness. Nothing moved. The spot and its immediate surroundings felt suspended. I realized, when I spoke to Julie about what I saw, that I was barely breathing. My breath was completely quiet. As if I almost didn’t need to breathe at all. I could feel the ancientness (if that’s a word) of this place. It did feel as if it had been there before time was. And then something very unexpectedly happened. As I looked at the partial wall in front of me, where I surmised once stood the altar of the church, suddenly – and I can’t describe this any differently – the walls began to rebuild themselves. But not with their original materials made out of stone, granite, plaster and wood. No. The walls rebuilt themselves out of light. As if the stones had merely the shape of a stone but were not made of stone at all but of pure light. After a while, the church walls reached the ceiling, closing the gap until what I saw was the most beautiful building imaginable, with all the details like moldings, figurines and ornaments completely intact but made not of their usual material but out of light. The whole building had a soft glow to it. It was slightly transparent but looked very solid. And yet not solid in the usual sense. Clearly defined, very strong, but transparent. What I saw was a perfect representation of what had been there originally. And what was broken, fallen down, deteriorated by eons of time, was still there – untouched and unchanged. As if everything that exists in time, still has its original shape from before time was. The image of the finely outlined church made of light, against the grey sky, was magnificent. Three years later, I began to write The Three Feathers which, originally, also came out of one of the sessions. When I got to chapter 12, I knew I should incorporate what I had seen at Julie’s office a few years earlier. This became one of my favorite chapters of the book. Something significant happens there albeit very quietly with not much noise. Here is the excerpt from The Three Feathers. Just before this section, Joshua, our hero, and Grey, the wolf, come into an ancient city from which only ruins are left. But suddenly something unexpected happens, as the whole city begins to rebuild itself out of light. We all know and always look forward to that small segment in all the super hero stories and movies where we find out how the super hero actually became one. Spiderman gets bitten and begins to develop his abilities, the Hulk is being exposed to gamma radiation and changes for the first time, Iron Man develops his suite, learns how to use it, and so on. Usually, any story about a super hero has a small portion of it set aside to tell the tale of how the hero became who he or she is now. The White Dragon tells the story of eighteen-year-old Kasey Byrne, an average teenager who lives on Long Island and who has just finished high school when the apocalypse hits full force. The first book, The White Dragon – Genesis, is a real time account, through Kasey’s eyes, of the first thirty six hours of this apocalyptic event. Toward the end of book one, it becomes clear that the opponent – an ancient demonic being that wreaks havoc on the island while spreading a terror that is beyond the imaginable – is much more powerful than anyone could have thought. In book two, The White Dragon – Crucible, Kasey has to leave this world and travel through a gateway to a different time and place where she will be trained for one single purpose: to find the white dragon, to tame it, and to bring it back to our world in order to save it.. But nobody has ever found the dragon and the odds are stacked against her. For her friends, a small group of survivors hiding out in a thrift shop in Babylon, one hour passes. For Kasey, three years go by before she returns. While the apocalypse unfolds and throughout her training, something inside Kasey awakens. It is gift and curse alike for it can destroy her or turn her into the most powerful weapon against the evil that has reached the shores of our world. All three books – Genesis, Crucible, and Alchemy – are part of an overreaching arc, attesting to the birth of a completely new kind of super hero. The apocalypse, as horrific and all consuming as it is, is nothing against the inner battle Kasey has to fight in order to become who she needs to be. 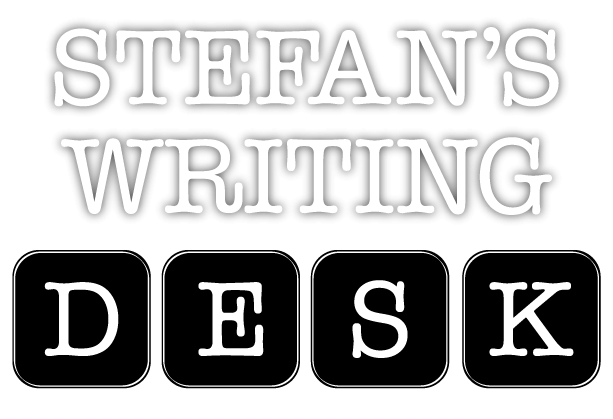 I’m in the midst of writing book two at the moment. May the epicness ensue. Have you ever had dreams where the natural laws were suspended, where you were able to swim under water for long periods of time, or float in the air without wings? I’ve had a lot of those dreams during childhood. In my early twenties, I discovered a German painter named Hans-Werner Sahm. His work could be categorized as surrealism as he paints stunning landscapes that never quite follow the natural laws of physics or nature. Nevertheless, or maybe because of it, the paintings evoke emotions of longing, hope, and limitlessness of spirit. We all know that the basic task of the writer is to evoke emotions in the reader. Ideally, each scene includes at least some element of that. Usually, emotion is created when one or more characters in the story go through experiences of loss, love, fear, external and internal struggle, etc. I always felt that landscapes can evoke those very same reactions, albeit in a completely different way. As an example from my own writing, in The Three Feathers, the landscape itself is what pushes a good amount of the plot forward. The characters travel from one location to the next and the landscape itself, dangerous and beautiful alike, becomes an obstacle or a place of refuge, depending on where they are on their journey. The images create an emotional arc, adding depth to the individual arcs of the characters. The depth of the landscape can mirror the depth of the emotions the characters go through at any given point in the story. I found that whatever the landscape is, should reinforce the emotion of the characters so that, even if there is a scene where nothing much happens in terms of character development, the emotional impact of the landscape is still present. Landscapes can make characters seem powerless and small in comparison, adding to the sense of danger and futility the characters have to overcome in order to reach their goal. In the book I’m working on right now, I have just reached the point where I was able to begin working on a map of the main character’s whole journey. Simply working on the map always provides me with immense insights into the story and characters. Plot points begin to fall into place and things come together more coherently. Drawing a map, to me, is always the most helpful part of developing a story (Besides, in this case, listening to an extensive amount of DRAGON FORCE!). The book is called Apocalypse Weird: The White Dragon – Crucible. It will be out next year. Hans-Werner Sahm does not have a web site but if you Google his name, most of his paintings will come up in the search. Can people become legends while they are still involved in the very process of becoming one? As a writer, it’s hard not to get inspired by someone who, by his very example, pushes others to become better at what they do. A writer’s writer, an author’s author, Hugh Howey embodies the ideal when it comes to those things. The goal of this post is not to boost his ego. There’s very little ego to boost there. There’s no pretense in the man. Besides, his boat is gonna be pretty small and he can’t take a lot with him on his journey. I met Hugh a few years ago in New York City during one of his early meet-ups. There were twelve of us. I had never heard of him until the day before when my fiancee told me that she had found this guy on the internet and that he’s an indie author, going to NYC tomorrow to meet people. I drove there. My car nearly broke down but I made it and we had a nice time discussing things I had no clue about, as I hadn’t even published my first book yet. The guy on the left is Dave Cullen, author of Columbine and a really nice guy also. That time, as far as I remember, was kind of pivotal as it was during those few days in Manhattan when Hugh had meetings with Simon & Schuster who would subsequently publish Wool in the U.S. I followed Hugh’s career from that day forward. He even gave me a boost when my first book came out. That was before he got really busy really fast. What I didn’t realize until now is the gift his journey has given (and continues to do so) to a lot of authors. He’s very accessible and shares his journey with his readers. As an indie author, that’s really helpful to watch. Not only does it give hope in the sense that if someone has “made it,” I might too, but there’s another level there that strikes a cord within me: If you put in the work, the hard work, the sweating, the dark room with no windows where it’s just you and your laptop, if you stay true to yourself against all odds, if you keep your integrity, you might go further than you think. Your voice might reach further than you know. Hugh is a lunatic when it comes to creating work. He publishes a LOT. Not only fiction but lately there’s a whole series of non fiction also. He will become a legend, I know it. Amongst us writers, he already is. If you want to know anything about writing or publishing or Amazon statistics, chances are, he can give you an answer that makes total sense. You don’t have to agree with him but you can’t deny the fierce intelligence and passion he’s got for books and the publishing process. You wanna know how to format your next book? There are a few articles out there where he explains it. Like really in-depth explains it. He’s there for us. He’s an open book (yeah, pun intended) when it comes to sharing his knowledge. So why am I writing this? I don’t have the slightest clue. I’m keeping my head down while trying to become a better writer, a more prolific writer, a more profound writer. It works once in a while. But when it doesn’t, there’s always this guy somewhere out there reminding me to keep going, to type those letters and make them into words and form them into sentences and get closer to reaching my own full potential. Thanks, Hugh. May your journey be fruitful and safe and freakin’ AWESOME!! !